Hello ... Hello ... my old friends ... It's great to see you once again! It was John Lennon who said of Chuck Berry: "If you tried to give rock and roll another name, you might call it Chuck Berry!" ... and he was right. The man credited by many with both creating the Rock 'n' Roll genre with his hanging guitar riffs alongside the seminal classics "Roll Over Beethoven", "No Particular Place To Go", "Rock And Roll Music", "Sweet Little Sixteen", "Johnny B. Goode" and "Maybellene" sadly passed away yesterday (Saturday 18th March) at ninety years of age. 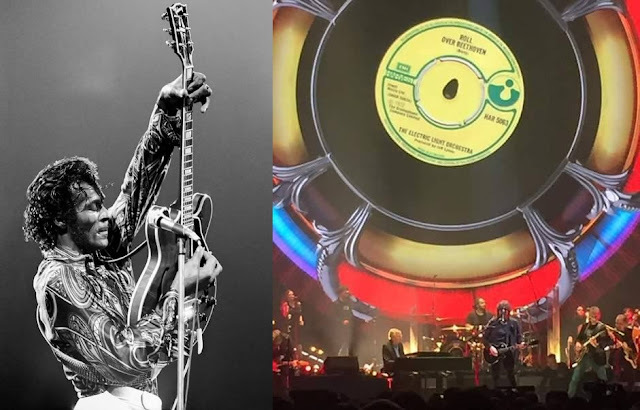 Fans of ELO and The Beatles are especially cognitive of the impact of Chuck Berry being as both The Fab Four and the Electric Light Orchestra are well known for their covers of "Roll Over Beethoven", both in the studio and, of course, in their live performances. You'll find it nestled nicely within "With The Beatles" and, of course, an eight minute plus rockin' stringed homage in ELO's second studio album "ELO II". "And the orchestra were playin' all Chuck Berry's greatest tunes"
Hence the name Chuck Berry has always been synonymous with both ELO and The Beatles. It was during those legendary "Do It With The Light On" gigs in the US that the live reputation of ELO was cemented, rewarding them with a respectable #42 in the Billboard 100 (UA-XW173W) as well as a #6 hit in the UK (HAR5063). Both releases were backed by the Jeff Lynne penned "Queen Of The Hours", taken from ELO's debut long player although early withdrawn copies, somewhat surprisingly, featured "Manhattan Rumble (49th Street Massacre)". 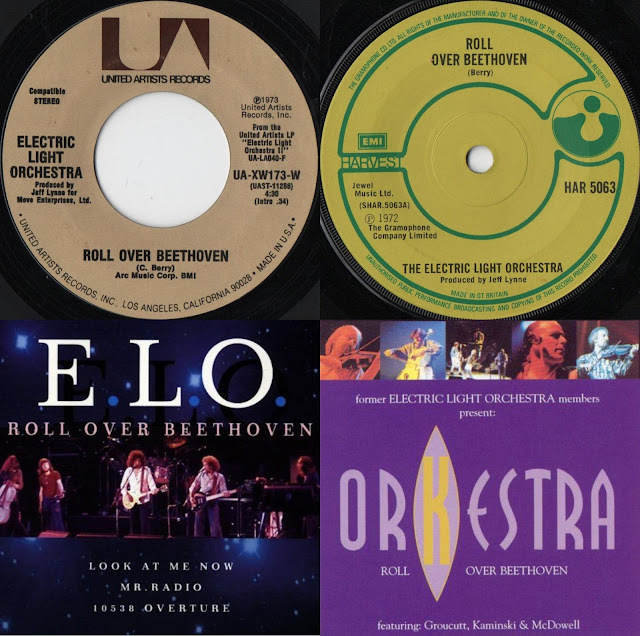 "Roll Over Beethoven" remains the encore of choice whether it be for ELO, Jeff Lynne, the growing number of ELO tribute bands and/or the many ELO offshoots featuring former members. As recently as Friday night, "Roll Over Beethoven" was the rousing finale to an excellent Trembling Wilburys gig in Birmingham, once again emphasizing the legacy (and contribution) of this inspirational musician, songwriter and lyricist to The Beatles and ELO stories. Farewell Chuck Berry - we dig your Rhythm and Blues.